Adding a screen porch to your home adds a lovely design element, but, more importantly, it provides a comfortable hangout for your family and friends. You can do a lot of quality living out on your porch. When you build or renovate a porch, you do need to respect building codes. While some of these restrictions may seem annoying, they are necessary for safety reasons. A number of codes apply, including those pertaining to guards, guardrails and balusters which is why we created our MeshGuard guardrail infill screening system. In the United States, generally any porch 30 inches high or above will need a guardrail solution. 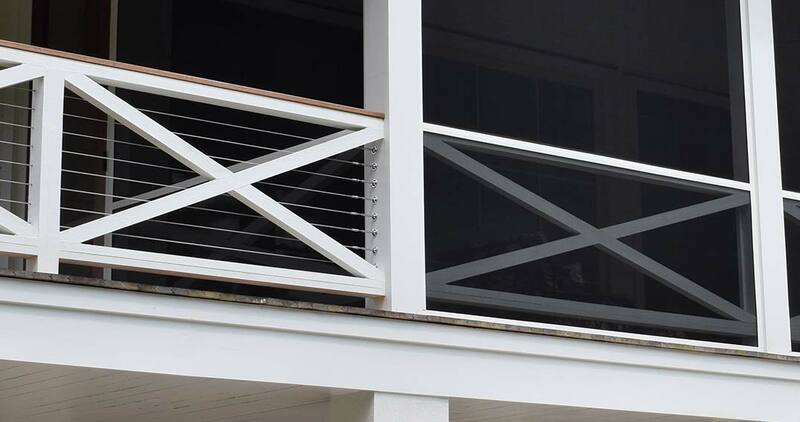 Some people choose to use infill guards or vertical pickets, balusters or spindles below the handrail but if you’re building a screen porch, you can skip this step by using MeshGuard. For screen porches under 30 inches high a guardrail isn’t required, but if you choose to install a handrail, the support will still need to meet basic building codes. After all, if the rail is there, people will lean on it. A baluster is simply a decorative column that supports the balustrade — a fancy word for pickets and spindles. The balusters are required to keep people from falling off your porch by leaning under the balustrade. These columns are mandatory unless you choose a solution like MeshGuard. In general, the spacing between these balusters should be no more than 4 inches apart to keep children from getting their heads stuck between them. Your porch stairs will need a handrail for safety. The stair treads themselves must be able to support 300 pounds in a 4-inch square. Simply put, your porch must be sturdily built according to local standards. Screen porches are a dream during at least three seasons a year. They add living space to your home and encourage more interaction with the outdoors. When building your porch, be certain to follow local building codes. If the local codes are somewhat lax, consider integrating international standards. If you’re considering using MeshGuard, learn more about how to install our guardrail infill screen. This entry was posted in Resource Articles and tagged MeshGuard.